When typhoon Nuri was raging in the Pacific last week it was certainly a most impressive storm but it wasn't until it caught the jet stream and hitched its way up to the Bering Sea that it really started to make a name for itself. While having weakened into a tropical storm on November 6th, Nuri underwent an intense transformative process called explosive cyclogenesis or bombogenesis in which an extratropical or mid-latitude cyclone drops in surface barometic pressure by 24 millibars or more in a 24 hour period. We all became aware of this process back in October of 2012 when Hurricane Sandy turned into a powerful "bomb" before going on to wreak havoc on New York City, causing damage in excess of 19 billion dollars. 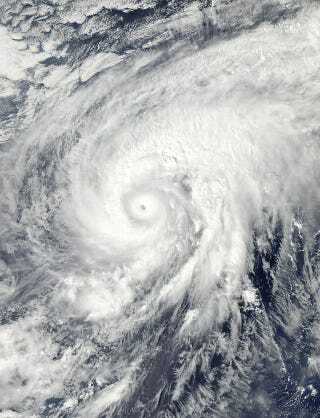 The video below shows Nuri as it forms into a super-typhoon southeast of Japan and then curves around on a north-easterly track to catch the jet stream and roll into the Bering Sea where it undergoes bombogenisis and becomes the most powerful storm in recorded history ever to impact the region. But how is this affecting the massive plunge of arctic air that is now rapidly descending into the United States causing temperatures to plummet 20 degrees at the Denver International Airport today in a mere half an hour's time? Well it turns out that Nuri pulled a mass of warm air north causing the jet stream to buckle, sending a surge of arctic air down into the U.S. which will make its way as far south as Texas and impact most of the country with bitter winter chill. So, if you happen to be a U.S. resident in one of the affected areas and find yourself freezing in your nether regions and feeling a lot like this guy, you can blame a storm system that began its life as an area of low pressure in tropical Pacific waters a few hundred miles southeast of Guam.